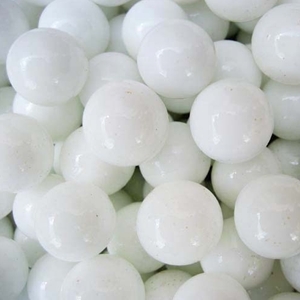 This is a bulk quantity of opaque white 18 - 19mm or approximately 3/4" diameter game marbles. Opaque marbles work well for games such as Chinese Checkers and Wahoo. For help determining size, go to our marble info page. Comes in a 1 pound bag which is approximately 59 marbles (give or take a few depending on acceptable variations in the size of the marbles). Also available in an approximately 200 count bag. Marbles will vary slightly in size and color due to the nature in which they are made. Approximate counts will likely vary depending on acceptable variations in the size on the marbles, which can be up to 1 mm smaller or 1 mm larger than the named size. Warning: this toy is a marble and is a choking hazard for children 3 and younger.